This has been a year of major transition and growth for me. Some of the change has been personal - such as my involvement in the Occupy movement, and Faith's and my decision to purchase a house in DC. Other change has been more corporate, such as the increasing maturation of Capitol Hill Friends, and developments within Rockingham Meeting, Stillwater Quarterly Meeting, and Ohio Yearly Meeting as a whole. For me, 2011 was a year of reality checks. At many points, I have been brought low. I pray that these experiences will produce a lasting groundedness in me. The big adventure this year was my summer travels to England, Kenya and Rwanda. The voyage began with a week-long layover in London, which allowed me to visit a number of British Friends connected with Ohio Yearly Meeting, as well as some others whom I knew through the 2010 Quaker Youth Pilgrimage. I believe that these opportunities were a blessing both for me and for those who welcomed me, and I was grateful for the chance to become better acquainted with the context of Friends in the UK. Following this, I joined my colleagues from ESR on a tour through East Africa. We saw Nairobi, went on safari, and visited Friends in Kenya's Western Provence. Then, we flew to Rwanda, where we were able to meet Friends from Rwanda Yearly Meeting. I was very impressed with the faith of African Quakers, and saw how Friends there hold many pieces of the radical Quaker faith that we in the United States often miss. At the same time, I witnessed some of the effects that poverty and a history of colonialism have had on our African brothers and sisters. Above all, I was convicted of my own society's ingratitude for the wealth and privilege that we possess. How do we as citizens of post-colonialist nations take responsibility for our luxury, which to a great extent has been purchased with the blood of non-European peoples? This is a question first and foremost for the Church, which claims faith in Jesus Christ, who proclaimed good news to the poor and freedom to the oppressed. I brought these concerns back home to DC, realizing that our spiritual barrenness in the developed world is perhaps an even greater burden than the material poverty of those in the global south. Together with Friends at Capitol Hill Friends, I feel called to be a light in the darkness, an embodiment of Christ's love in a culture that has largely turned away from him. A big part of this calling has found expression through the continued development of Capitol Hill Friends. In February, we had a major shake up when two of our five core people felt the need - for a variety of reasons - to withdraw from the community. This was a major blow, which knocked the wind out of us for a little while. It forced the three remaining core people to get even more serious about the direction our group was headed in. It was at about this time that we made the decision to switch our worship time from the 2nd and 4th Wednesday evenings to Sunday nights. Along with a new meeting time, we also began to gather much more regularly as a core group. Starting in the fall, the core group has been meeting once or twice a month for prayer, discernment, decision-making and mutual support. As the year went on, we became clear that Capitol Hill Friends is actually a little church, not just a worship opportunity. We recorded three members, and incorporated Capitol Hill Friends as a legal entity. In the fall, Lily Rockwell of Stillwater Monthly Meeting (Ohio Yearly Meeting) came and joined us as a sojourning member of our fellowship. She has been invaluable in helping to nurture the church, and we are very grateful for God having sent her to us. At this point, Capitol Hill Friends has three regular members, one sojourning member, and approximately a dozen attenders. Our normal attendance on Sunday nights is about eight. While these are not huge numbers, we have experienced a remarkable shift from 2010, when Capitol Hill Friends was primarily a worship opportunity but had no real core or sense of identity. Now, Capitol Hill Friends is an independent church in the Quaker tradition, albeit a small one. As such a tiny group, relationships with a wider fellowship of believers is crucial. We have found most support in our relationship with New City Friends, another new Quaker church in Detroit, Michigan. Late last year, we adopted a shared set of Advices and Queries with them, and each of our communities has been answering them on a monthly basis. Also, we met twice this year for joint retreats; the first taking place in Washington, DC in April, and the second occuring in Detroit, in November. At our November meeting, Friends from New City Friends and Capitol Hill Friends felt clear to continue to deepen our relationship as an extended fellowship. We agreed to make slight revisions to our Queries (to render them more straightforward to answer), and we were in unity to hold two joint retreats in 2012. The exact dates have not yet been set, but we plan to gather together in a central location in the spring and early fall. We hope that other Friends, worship groups and Meetings of like mind will join with us and explore what it means to live a faith of radical discipleship to Christ Jesus in the early 21st century. There is, however, a sad subtext to these exciting developments. I feel very pleased with the growth in relationship between New City Friends, Capitol Hill Friends, and others Friends of like mind; and I believe that this new association has the potential to offer a vibrant alternative for Friends in North America. However, we had hoped that we would not be forced to go independent. Both New City Friends and Capitol Hill Friends were turned away by pre-existing Friends bodies. Some Friends are uncomfortable with our uncompromising commitment to shared Christian faith. Others are put off by our clear affirmation of our gay, lesbian and transgender brothers and sisters. Despite our best attempts, there seems to be no existing body that has room for all of who we are. This has been a source of great sadness for us; however, we must be faithful to the witness of the Holy Spirit in our midst, even if our sister Yearly Meetings cannot embrace us. Please pray for Capitol Hill Friends, New City Friends, and for the many Friends today that find nowhere to fit in within existing Yearly Meetings. Pray that God will strengthen us in our faith and in our fellowship, and that the Spirit will draw together other individuals and groups who are being called into this new thing that Christ is doing today. Before I conclude, I cannot fail to mention the immense impact that the Occupy movement has had on me these last few months. I got involved early in this movement, because I felt the Lord's hand on me, urging me forward. I was in New York during the second week of Occupy Wall Street, and I was one of the original organizers of Occupy DC. Now, I feel that the movement has reached a turning point. Phase one is over, and something new must emerge for us to continue to have an impact. I do not know what exactly this next phase will look like, but I am praying that it might have the effect of empowering ordinary working Americans to re-assert their rights and responsibilities as citizens, taking power back from the corporations and monied interests that have so undermined our democracy. The experience of being and organizer for the Occupy movement has changed me. During college, I became totally disillusioned with activism, and since that time have not thought of myself in those terms. It was a great surprise when I sensed God calling me to participate in this movement. Much more so when I realized that God was leading me to be one of the main people to get things going in DC! This movement has radicalized me. I can no longer sit on the sidelines while billionaires and their servants transform our democracy into a corporate state. I can no longer keep silent while the rich grow richer at the expense of the most vulnerable. I can no longer maintain neutrality while the middle class is obliterated. In recent months, I have been awakened to the radical implications of Jesus' jubilee proclamation(1). I must stand with the poor and oppressed. I must witness to the damage being done to women and men - and to the whole of creation - to satisfy our greed and idolatry. I can no longer preach a spiritualized gospel, reduced to personal spiritual growth. God's justice and salvation must be embodied among the poor, in our prisons, in the oil-soaked Gulf of Mexico, and in the halls of power. Thank you for walking beside me in this journey. This year has been a wild ride, and I have no doubt that 2012 will be at least as full of surprises. Just before Faith and I left DC for the holidays, we bought our first house, located in Northeast DC. Please pray that we be blessed in our new home; and for our life together as we deepen our commitment to our city, our church and our extended community of friends. Have you ever had Holy-Spirit whiplash? Have there been times in your life when you have felt God directing your life down a certain path? Steadily. Unrelentingly. It goes on for months or years until, all of a sudden, the call shifts dramatically. The new sense of direction is clear, and it feels right, but it takes some time to wrap your mind around it. In the last month or two, I have been experiencing a big shift in God's call on my life. In late 2005, God set me aside for full-time preparation for ministry. God called me out of my job working at a bank in Wichita and directed me to study at Earlham School of Religion. I did some paid work during the course of my studies, but virtually all of my time and energy was plunged into study, prayer and preparation for ministry. After completing the MDiv program, God continued to call me into full-time ministry. I spent the spring of 2009 traveling in the Great Plains, ministering among Friends in Kansas, Nebraska, Oklahoma, Missouri and Texas. While I hope that there was some benefit to those I visited, this work probably had more to do with my own preparation for ministry than it did with any gift I had to offer. I was out of seminary; but in many ways I was still in school. In the fall of 2009, I married and moved to the District of Columbia. I also began work for Earlham School of Religion, doing web strategy and outreach to Young Adult Friends. This new job fit very well with my own sense of call, my leading to travel among Friends in a variety of theological and geographical contexts. It was work that called me to venture across the United States, developing networks that would strengthen both ESR and the Religious Society of Friends as a whole. My role with ESR has dovetailed very well with my own sense of God's call on my life; and the work has been part-time, allowing me sufficient space to be faithful to a life of dedicated ministry. I have had the best of both worlds - both gainfully employed, and released for gospel ministry. Apart from my work at ESR, my main focus in the last two years has been the development of Capitol Hill Friends, a new Quaker church in DC. It started out with just Faith and me inviting folks to come and worship with us, and it has blossomed into a small church with four members and around a dozen attenders. With my other "part-time," I dedicated myself to strengthening and supporting this new community; and it has been a blessing to see our development as a Meeting, especially in the last year. Given this little bit of history, you can see how it came as a shock to me when I realized recently that God no longer seemed to be calling me to full-time ministry. It was not that God had revoked my calling or spiritual gifts (though these have certainly evolved over the years). It was not that Capitol Hill Friends or the work of tending the flock became any less important to me. If anything, these things have become only more central in my awareness. Yet, in recent months, I have felt God calling me into a new life stage, with its own set of blessings and responsibilities. Up until now, I have primarily conceived of my call in terms of the itinerant ministry modeled by the early Friends. This sort of ministry - that of Fox and Burroughs, Nayler and Pennington - was not firmly rooted to a specific place. On the contrary, it was a missionary faith in constant motion, publishing the truth far and wide. These Friends preached to all sorts of people in many different lands. They were nothing if not mobile. In the past few months, however, this vision has come to ring hollow for me. While God may have called me to this sort of itinerant ministry in previous years, I have become convicted that God brought me to DC for a different kind of service. While I have long avoided commitments that would bind me to one place, I now feel compelled to embrace them. Before, I looked down my nose at the stable shepherd in the local church, tending to the day-to-day needs of God's people. I longed for more exciting work; the fiery preaching of George Fox and the mass conversions of the Valiant Sixty. I thought I was special. But now, in the spicy-sweet irony that carries the mark of the Holy Spirit, I sense I am being called into the steady endurance that I once despised. Maybe God has decided that it is time for me to grow up - or, at least, to move a little bit further down the path of maturity in Christ. My mind is still reeling from the whiplash, but my heart can sense the truth. I Am a Christian. I'm Sorry. This evening, I read an essay in Friends Journal entitled, "I Beg Your Forgiveness," by Eden Grace, a seasoned Quaker missionary in East Africa. Eden explained that she felt prompted to ask forgiveness on behalf of her people - Christians - for the ways in which we have not lived up to the faith that we profess. She faulted the Church for our judgmental attitudes, spiritual pride and failure to act for justice. She concludes her essay with these words: "On behalf of myself and my people, I beg your forgiveness." A short time later, I came across a video of Chris Tse - a spoken-word artist from Canada - reciting a piece which begins and concludes with the words, "I'm a Christian. I'm sorry." In his spoken word poem, Tse goes even further back than Eden Grace, alluding to the Crusades and New World genocides carried out by men who professed Christian faith. The video by Chris Tse was posted by a friend of mine on Facebook, and by the time I saw it there had been one comment. The commenter suggested that Tse, if he was truly sorry for the things done in the name of Jesus, should stop being a Christian. While I can resonate with many things that both Eden and Chris expressed in their own unique ways, it makes me nervous when Christians start making apologies to the non-Christian world for the historical and present-day sins that are committed in the name of Jesus. While no one can deny that horrible things have been done in the name of Christianity, I wonder whether it is a good idea to accept all of the blasphemies of Western Christendom as being legitimate expressions of the Church that we are now responsible for as Christians. This is a tough question, I know. The truth is, whether or not Pope Urban II or Christopher Columbus were really disciples of Jesus Christ, they propagated death and misery under the banner of Christianity. Just as atheists must grapple with the historical fact of Stalin, Mao and other secularist dictators, we as Christians must take seriously our responsibility to clarify - and demonstrate - the true nature of the Christian faith. We must renounce evil, not only as we see it in historical figures, but also in all the ways it is manifested today in the Christian community. We must turn away from greed, hypocrisy, racism and homophobia. But does that mean taking responsibility for every criminal empire that has justified itself through a twisted interpretation of the Christian tradition? How about the many today who justify war, systemic injustice and oppression with the name of Jesus on their lips? Whose conduct am I responsible to apologize for? At what point do we say; "No. I am not with them; never have been." This is a very personal question, but also one that we might consider wrestling with together as Christian communities. What response can you give? How might your church respond? What do we have to apologize for? Since the eviction of most of the major Occupy camp sites, including the original Occupy Wall Street encampment in lower Manhattan, many of the most cogent thinkers within the movement have come to the conclusion that the original manifestation of the Occupy movement - sleeping in public spaces, maintaining encampments twenty-four hours a day - is increasingly nonviable. In the month since the eviction of Occupy Wall Street, along with many other sites around the country, this sort of 24/7 camping has become impossible in most locales. One city that still stands as an exception to this trend is Washington, DC. 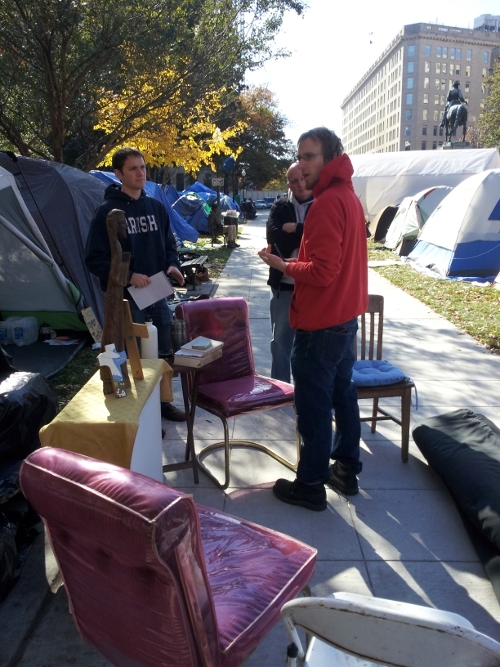 Occupy DC is one of the few major occupations that has been allowed to maintain a public camping presence. In some ways, this has been a real blessing. We have not suffered the trauma that many of our brothers and sisters in other cities have been forced to endure. Police violence has been almost completely absent. Nevertheless, there are downsides to the relative ease with which we have been able to camp in McPherson Square. As many predicted in the first weeks of the Occupation, the lifestyle of urban camping has at times threatened to overshadow our real mission as a movement: challenging corporate power and preeminence in our political discourse. At times, internal camp politics has been a barrier to moving forward as a cohesive movement for change. To mention just a small example of this, we in DC have had to struggle with our relationship to our city's pre-existing homeless population. Does our mission include providing social services to those with the most desperate needs - both material and, often, psychological? Or does our inexpert attempt to play social worker distract from our core mission, to address the roots of systemic injustice? Trying to deal with everything, we have often failed to accomplish much of anything. Even in DC, where authorities still allow us to camp out, many of us have come to the conclusion that this form of protest no longer advances our primary goals as a popular force for justice. Outdoor camping as a form of protest was incredibly effective in the early days of the movement; but many of us - even here in DC - believe the time has come for a new strategy. What might this be? How do we translate our initial surge of energy, fueled by inchoate indignation, into a sustainable movement for broad political reform? How can we promote a national paradigm shift away from greed and towards a love-based economy? So far, we have only identified the problem. We have not yet clearly demonstrated solutions. One possible way forward would be to focus our efforts on establishing local general assemblies. Rather than seeing the General Assembly as an event that only takes place in a single park in each city, what if every neighborhood had its own general assembly? What might it look like to have workplace general assemblies? Whatever the specifics, it is clearly crucial that the Occupy movement transcend the relatively small numbers that are presently gathering in parks, bars and coffeeshops. Though we seek to give voice to the outrage of the 99% of Americans who are left without a say in how our country operates, we have by no means become as broad-based as we ought to be. If the movement is to grow and gain momentum, it will need to open its embrace to the whole of the 99% - not just those who have the time, energy and physical stamina to spend their days in frost-bitten parks. We young radicals have done our job, and done it well. But the needs of the movement are evolving. It is no longer enough to be enthusiastic and vigorous. We must be strategic, working alongside the millions of women and men who quietly support us but have no interest in playing fort. This will mean reaching out to individuals and institutions that seem decidedly non-revolutionary. Labor unions; civic organizations; all manner of non-profits; faith-based groups; and neighborhood associations - we must reach out to any group that is willing to walk with us as we take the next steps towards greater political transparency, economic justice, and peace. In this process, we must be willing to be changed. Rather than striking a belligerent pose while our movement falls to pieces, we must be willing to adapt and grow as the movement expands. This will call for us to operate at our best, bravest and most creative. 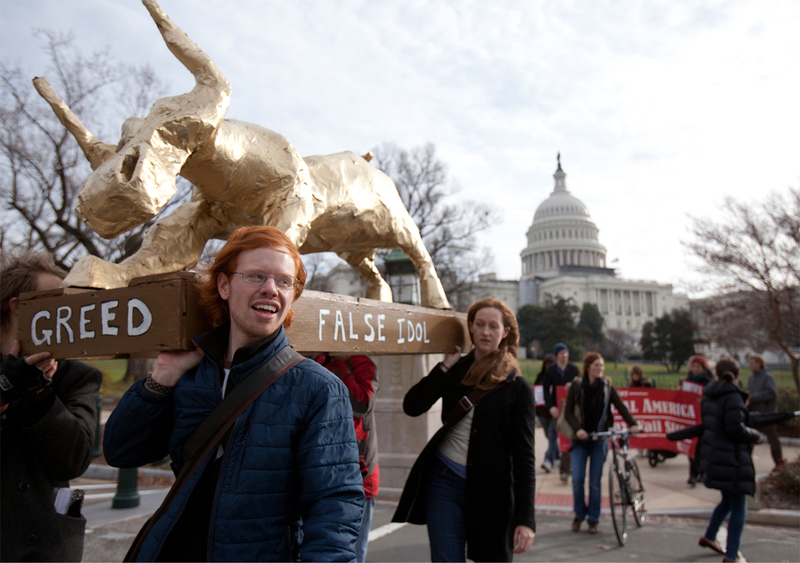 Yesterday morning, I helped deliver a golden calf to Congress. Starting off at the Occupy DC encampment in McPherson Square, we bore a shining paper-maché bull approximately two miles to the US Capitol Building as a sign of our spiritual condition as a nation that worships greed rather than God; a society that values profits over people. This demonstration brought together people of faith - especially Christians and Jews - who bore witness against the unjust economic systems that have taken root in our nation. 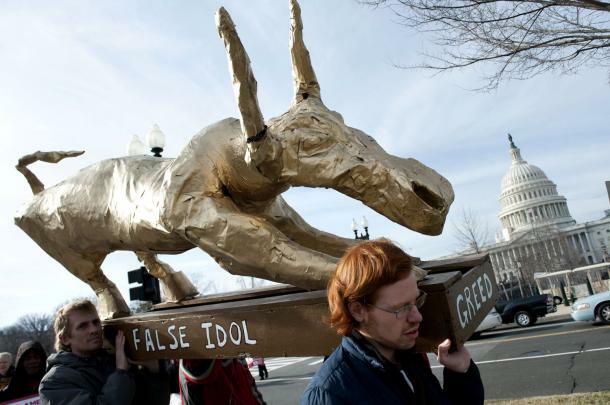 The image of the golden calf is an ancient one, shared by the three Abrahamic religions - Judaism, Christianity and Islam. It represents the fearful worship of money; the denial of God in the rush for man-made security and prosperity. Human society is always a struggle between our tendency to worship the golden calf of our own frightened selfishness and our true calling as children of the God of mercy, justice and truth. Unfortunately, our nation is caught in a downward spiral of Wealth-worship. We live in a country where billionaires and giant corporations pay little or no taxes; yet this same nation is cutting social services for the mentally ill, homeless, disabled, and working poor. We live in a society where working families are being evicted from their homes while the banks that dreamed up their bad loans have been rewarded - bailed out from a mess that the poor and middle classes have been left to clean up. Today, as we stood before the halls of power in the wealthiest country in human history, we proclaimed God's righteous anger; anger against an economy and government that oppresses the poor so that the rich can inflate their already obscene wealth. We sought to remind lawmakers of God's judgment against those who abuse their positions of authority, abandoning the most vulnerable in our society and instead taking sides with those who have the most. I pray that this Scripture will be fulfilled in your hearing. I pray that we as a nation will receive the grace that the Lord gave to Nineveh. I pray for God to fill our hearts with the spirit of repentance, inspiring us to put the needs of the poor and marginalized first. Let us imitate the Lord Jesus, who laid aside all honor and glory so that he could become a servant to all. The last few months have been jam-packed: Full of tasks to be accomplished. Full of worry. Full of demands, deadlines and stress. My life has been so overloaded that oftentimes there has been little room for contemplation. Even when I have taken time to pray, my heart has often not been engaged. I know intellectually that God is always present with me; but at times it has been a challenge to experience it viscerally. I know by now that I cannot will myself to feel God's presence. It a pure gift when we experience the joy of Christ's love in our lives, and sometimes that gift is not given. Sometimes, God lets us experience spiritual drought. There are times when we can do nothing but ache for God, knowing how far we fall short. This longing for God is a gift in and of itself. I give thanks for the awareness of my need for God. It is God's grace that allows me to recognize the heaviness of my life; to become aware of the burdens that I stubbornly carry, despite Jesus' promise to lift them from me if I trust in him. 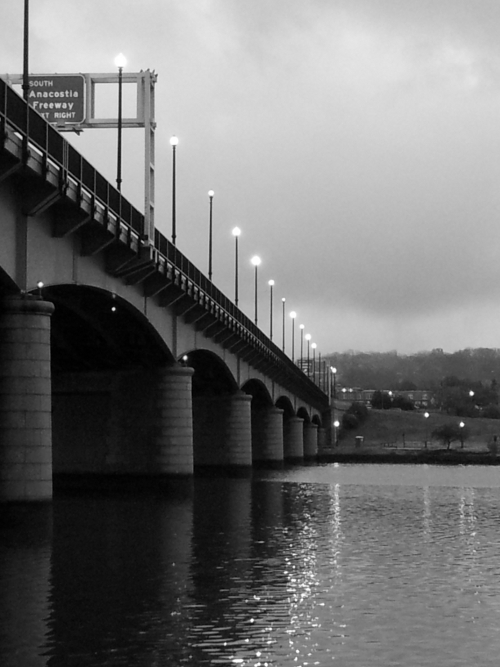 The life of discipleship is not a simple linear progression towards inward peace and joy. As I take halting baby steps towards becoming more like Jesus, I share in some measure of his suffering. As I seek to live as a child of the light, I must bear the sight of my own darkness. Only by facing my own brokenness can I ever hope to be healed. Sometimes, the Truth can seem like darkness. But I pray that God will continue to grant me the grace to see that the darkness I experience lies within my own heart. Christ's light reveals it, if I am willing to see; and he will heal me, if I am ready. Dear Lord, remind me daily of my need for you, and grant me the faith to receive the transformation your Light brings. 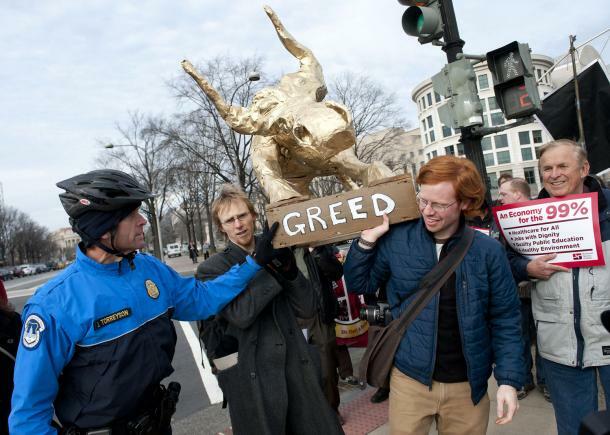 Last month, it felt like my life was about to explode with the intensity of my involvement in Occupy DC. This month, I have been intentional about taking a step back from the Occupation, no longer spending most of my time out at the encampment. Yet, the feverish pace of my life has not diminished one bit. If anything, it has sped up. There was plenty of work to fill the void. To begin with, I took several long trips this month, including to participate in a gathering held in Detroit. This was an opportunity for Capitol Hill Friends to gather together with our sister church - New City Friends - and consider our way forward as a fellowship. Friends in Detroit were wonderful hosts, and it was a blessing to get to know the newest members of their group, as well as some Friends from the wider region who joined us for the retreat. It feels like our little network - which includes Capitol Hill Friends and New City Friends - is growing in depth and unity in the Spirit. We sense something new happening in our midst as the Spirit of Jesus gathers us and shows us how to walk. As a sign of this deepened sense of commitment and shared purpose, we agreed to begin holding regular gatherings. We will meet two times in the coming year, once in April and again in September. Please pray for us as we seek God's guidance as an emerging expression of God's people. Back in DC, our life as a church has also shown signs of development. In addition to worship, Capitol Hill Friends has been meeting regularly to conduct business and to pray together about how God wants to use us here in our city. We are growing closer together as we seek the Lord's will, and we are being given some weighty discernment to do together. This past Saturday, Capitol Hill Friends sponsored a contemplative Advent retreat. The goal of this event was to create a space for reflection and contemplation, for grounding ourselves in Christ's love in the midst of a hectic holiday season. The retreat went all day, and concluded with a meeting of Capitol Hill Friends in the evening. We were pleased that some folks who have not been involved with our Meeting were able to attend the retreat. We benefited very much from their participation, and we hope they will continue to take part in our community. We at Capitol Hill Friends continue to reach out to friends, co-workers and neighbors, inviting them into our lives. We hope to provide an ongoing invitation to a life of deeper listening, love, and faithfulness in community. This invitation is desperately needed in our city, where so many are over-burdened with work, anxiety, and a busyness that tends to stifle the inward life. As a Quaker church on Capitol Hill, we seek to hold a space where all who are weary can come and take up the easy yoke of Jesus. This is something that I need, too! I have been frequently overwhelmed in recent months, and I feel the call to slow down and be truly present with the people who surround me. I sense God nudging me to settle, to become a steady, grounded presence with those who are rushed and uprooted, carried along by the streams of frenetic energy that flow so freely in Washington. I recognize that I, too, am often caught up in this frenzy. I pray for Jesus to liberate me more fully from the heaviness of self-centered living, so that I may be more present to the suffering of others. One reason that I have been feeling so burdened lately is that Faith and I have been looking for a house. For a little more than two years, we have lived together in a room on the top floor of the William Penn House. In recent months, we have felt called to settle down in the city - and a part of that is looking for a more permanent residence. This month, we have spent a large amount of time and energy searching for a home that we could afford and which would meet our needs. In a housing market like the one we have in the DC metro area, this was no small task. This process of house hunting has been fascinating, educational, and thoroughly stressful. Fortunately, it seems we may be nearing the end of the ordeal. As of yesterday, we have a ratified contract on a house here in DC. While nothing will be certain until we close on the property, it looks likely that we have found the house that we will be living in for the foreseeable future. It will be a great relief to complete this process, and a real joy to finally be rooted here in our adoptive city. I am grateful for all of you who hold me, Faith, and Capitol Hill Friends in your prayers. We give praise to God for you and the support that you provide us. Please continue to hold us in prayer as we look forward to a new year of labor for Christ's kingdom. May his peace be with your spirit. The days are growing very short now, as we get closer to Christmas. The day that Christians celebrate the birth of our Savior is nearly the shortest day of the year for those of us in the Northern Hemisphere. We choose the darkest day to remember how the True Light came into the world to liberate us from slavery and death. Yet, I do not personally experience December as a time of liberation and joy. As daylight hours diminish, I am burdened by the gloom of the darkened days and the cold winds that discourage me from venturing outside. And I know that this is only the beginning. I can expect months more of darkness and cold. If anything, the Christmas season is an introduction to the darkness, not the end of it. The winter, with its lack of light, warmth and energy, is a time of purgation for me. During these days - starting around Christmastime - I am stripped down. All my ambitions are laid bare and I am forced to look at the naked truth of my life. Gone is the self-forgetfulness of summer. Winter is a time when I feel compelled to gaze unsentimentally at my life, and the wool I pull over my own eyes. Like the leafless trees, I am laid bare. Perhaps this is the experience of Advent after all. The reality of Christ's coming, of his arrival into our everyday world, is startling. Jesus' light turns everything upside down. He reveals that many of the things we considered important are, at best, distractions; and he uncovers the hidden, neglected parts of our lives that are precious beyond all expectation. Christ's coming can be painful. For me, his advent in my life has often been fearsome. The light of Christ can soothe and comfort when received by those who are gentle and humble of heart. But I am not always gentle, and I am often proud. When Christ's light dawns in my heart, I often experience it more as a consuming fire than as a gentle comforter. As I receive Christ into my life this dark December, I feel a kinship with Mary, who carried our Savior in her womb. There is new life inside me, too; and my old body cannot contain it. Jesus is stretching me, changing me, kicking inside me as I am prepared to deliver him into the world. Like Mary, I am called to bear my Savior, and this delivery will require nothing less than total transformation on my part. I could try to resist God in this process. I could refuse to cooperate with this new life growing within. I could decide to stay the same, to ignore the hard truth that Christ reveals. But there is a better way, this winter and always. With God's help, I will embrace the searing light of Christ. I will seek to be transformed into a worthy vessel for Christ's coming.